1.2 Meter House Gets A Tenant! Add this to the weird and wonderful file. A 1.2 meter house in Warsaw Poland got it’s first tenant, Israeli writer Etgar Keret, who evidently comfortably fits into the place. Etgar sleeps in a tiny bed. Architect Jakub Szczesny said he designed the two-story aluminum and plastic house three years ago to fill a narrow space between a pre-war house and a modern apartment block in downtown Warsaw. Interesting idea. The Foundation of Polish Modern Art and Warsaw Town Hall helped to fund the project, which is unanimously considered a work of art. 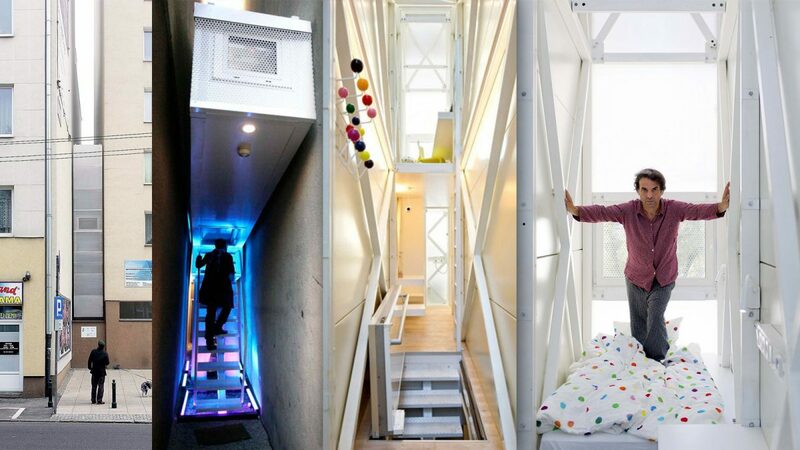 The house is just four feet (1.2 meters). At its thinnest, it’s 28.3 inches. Needless to say, dinner parties are probably out of the picture to some degree, however, this apartment probably won’t have any issue being a conversation piece. I’d love to see Etgar going to a Best Buy and telling the enthusiastic audio video guy about the home theater room he’s envisioning. Check out some pics of the place on Gizmodo, here.